Oilcloth has been around for about 100 years. You may remember walking into your grandmas kitchen and seeing a similar tablecloth on her kitchen table. It was relatively inexpensive, and often sold by the foot or yard in hardware or yardage stores. The original oilcloth was created by coating block-printed canvas or linen with linseed oil resin With age, the resin and design would crack and flake off. Today’s high-tech version is a vinyl-permeated cotton mesh. 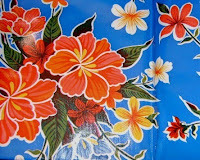 It won’t crack and peel but has the same shine and color vibrancy of the oilcloth of yesteryear. Some of today’s oilcloth is printed using some of the vintage designs, in many cases using the actual plates and rollers that were used for the vintage oilcloth.